- Perfect Fit: Seamless match your fitbit charge 2 watch. - Water Resistance: These charge 2 bands are sweat, rain and splash proof. - Large suitable for 6.5"-9" (16.5cm-22.9cm) wrist. - Small suitable for 5.7"-7.8" (14.5cm-19.8cm) wrist. - No tracker or accessories included. 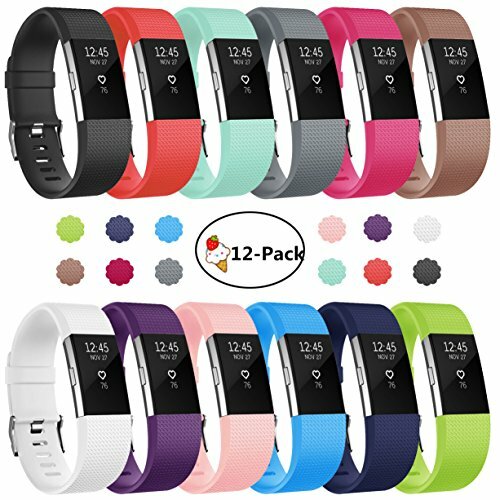 More Colors and More Choices: 12 different colors for you to choose, make your fitbit charge 2 more personalized to match your daily outfits and feelings. Change a color, change a mood and change a kind of luck! Easy to Take On and Off: The fine craft make the bands easy to install and one button disengage from your fitbit, no tool needed. Perfect Wearing Experience: Seamless match your fitbit charge 2 watch. Premium TPU materials make these bands more soft and more durable. All of this gives you a more comfortable wearing experience. Size Optional: Large for 6.5"-9" (16.5cm-22.9cm) wrist and small for 5.7"-7.8" (14.5cm-19.8cm) wrist. 24 Months Warranty: Hassle free replacement or money back during the warranty.